Strollers are a very key piece of baby gear that parents typically require from the newborn stage through toddler years, until a child is around 3 to 4 years of age, and is able to walk a distance on their own. However, some parents get extended use out of their strollers when using them for travelling greater distances or for long days spent out and about. There are so many types of strollers available on the market, you can very easily spend several hours perusing through the myriad of options out there. It can be difficult choosing what will work best for you your family, and there are several factors that you will need to consider when making your decision, including: where you live, where you expect to use the stroller, if you need something that will grow with your family, and how much you would like to spend, to name just a few. Whether you are looking for a traditional stroller, travel system stroller, jogging stroller, double strollers, or one that can grow with your family — here are our top 10 stroller picks for 2019 (in no particular order), that will hopefully help you when making your stroller purchase. As previously mentioned, a very important question you must ask yourself before purchasing a big-ticket item like a stroller is, do you plan to have more than one child? If yes, this can certainly impact your purchasing decisions. Unless you know for certain you would only like one child, I am a big advocate of getting a stroller that will be compatible for more than one child. I spent hours researching the various strollers on the market and one of my favorites is the Contours Options Elite stroller. Whether you have twins or two children close in age, this stroller is a very affordable, lightweight option that is sure to please parents and little ones alike. This stroller option falls under the ‘Double Tandem Stroller’ category. It comes with two seats included (where many double strollers require you to purchase the second seat separately. Its seats are adjustable and can be configured in over 16 ways! You can set the seats up to be either forward facing, rear facing or even allow your children to face each other. You can set it up with one seat or two, and when you purchase the car seat adapters, you can attach your child’s car seat (or even two car seats) — perfect for twins! This stroller weighs 34 lbs (which isn’t bad considering it is a double stroller capable of holding two 40 lb children for a total of 80 lbs). It is a very versatile stroller option, at a very affordable price for all that it provides! UPPAbaby’s Vista stroller is another great stroller option that is able to adapt to your growing family. It to has multiple configurations, and can even transport up to 3 children — all while strolling like a single! UPPAbaby’s 2018 stroller collection features new luxurious fabrics and full-grain leather details, for those of you who may enjoy strolling in style. The UPPAbaby Vista falls under the ‘Convertible Stroller’ category, however you can purchase the Vista in various packages. You can purchase the Vista Stroller with the one full-sized front or rear facing seat + the bassinet, or with two full-sized front or rear facing seats + the bassinet. Parents love the one-step fold process and it extra large, easy-access storage basket that can hold up to 30 lbs. This stroller can hold a child from 4 lbs – 50 lbs. The additional rumble seat however, has a weight capacity of only 35 lbs. Are you looking for a stroller you can hit the pavement with? 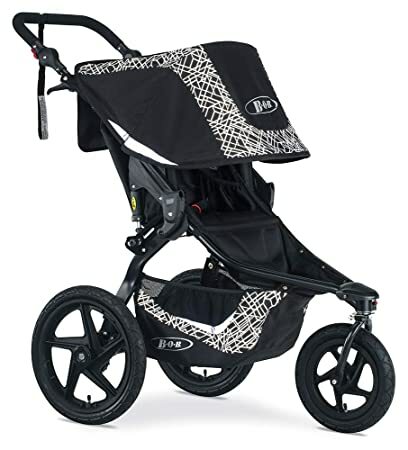 Go for a jog (or walk) with this BOB Revolution Flex 3.0! You don’t have to be a jogger to enjoy this stroller. It is perfect for any type of outing whether you are preparing for 10K race or heading to the park or zoo with your little one. You and your little one can stay safe during early morning or evening strolls with the Lunar ultra-reflective fabric on it’s extra large UPF 50+ canopy as well as on its over-sized cargo basket beneath the seat. This stroller can be used in two different positions. In position 1 it can accommodate 0-40 lbs, and in position 2 it can accommodate 41-75 lbs! With the Infant Car Seat Adapter and compatible Infant Car Seat, it is perfect for babies 0-8 weeks old! However it isn’t recommended that you jog with babies under 6 months of age for safety reasons. The adjustable padded handlebar can go from 34.5 to 48 inches in height, and has a wrist strap attached that provides extra safety when you are using it for jogging. The BOB Revolution FLEX Duallie is the ideal all-terrain stroller for two children! Whether it is twins or you have two little ones’, this stroller can be used from birth up to 50 lbs in each seat — although, again, for safety reasons it is not recommended you use it for jogging with babies until they are at least 6 months old. In order to keep the stroller less than 32 inches wide (which is the average door width), the strollers Infant Car Seat Adapter is only designed for one Infant Car Seat, not two — thus, it would not be suitable for twin until they are past the infant stage. 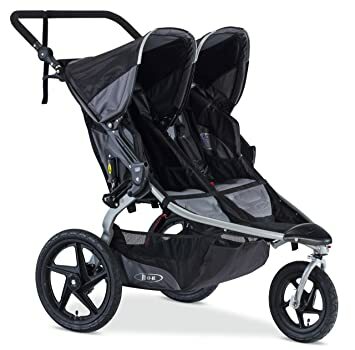 A really neat feature of this double jogging stroller is that it has two individual sun canopies as opposed to one. The canopies offer a 125 degree range of coverage to keep you children in shade no matter what angle the sun is. It is easy to maneuver, and features a two-step fold that can be complete in seconds. Another favorite of mine is this Baby Jogger City Select Lux. It is an all-terrain, convertible stroller that is perfect for your growing family. It has the most riding options of any single to double stroller, with over 20 different configurations. It is also available for purchase with the second seat included. Each seat can hold a child up to 45 lbs! The seats can be forward facing, backward facing, or sibling facing, and you can further customize the ride with accessories like car seat adapters, child’s tray, parent console, or weather shield, sold separately. You can even make this into a sit and stand stroller, accommodating three kiddos at once! (The bench seat and standing glider boards can be purchased separately). This is a perfect option for your growing family, and will allow you years of use! When you see how this stroller folds, you will be saying “I’ll take it!”. Baby Jogger’s City Mini series is their most popular and award-winning line. Whether you are in the market for a single stroller, double stroller, or a complete Travel System, the City Mini GT line of strollers will handle with ease on any type of terrain. Both the single and double options have their patented one hand, quick-fold technology, which is unbeatable by any other stroller on the market. They have fully reclining seats, great sized canopies with UV protection, and is a very lightweight and easy to maneuver stroller, wherever you may be using it! The single model can hold up a child up to 65 lbs, while the double can hold a maximum of 100 lbs total. In the spring of 2019, be sure to check out the upgraded model — the GT2! The Thule Sleek is a flexible, stylish city strollers that are ready to use from birth. This stroller sleek, modular design offers 13 configurations that will grow with your family and can carry up to three kids at once. You can add a bassinet or attach a car seat to stroll with your little ones from day one. These accessories are sold separately. The silent, one-hand seat recline is perfect for when you little one falls asleep, and its simple compact fold one-handed fold is super convenient for parents. Parents will also love the fully adjustable handlebar, and large cargo basket that expands to fit everything you need, and has a zip-top cover With its shock-absorbing 4-wheel suspension, your little ones will be in for one smooth ride, even on rougher terrain. Another Thule stroller line that is notable, is the Thule Urban Glide 2 and Thule Urban Glide 2 Double. This 2018 line of jogging strollers are available in either a single or double model. Both the single and double models feature a 12″ front wheel that can lock into place for jogging, and large 16″ rear wheels that are great for handling in all-terrains. The adjustable handle bar go from 35.5″ to 44″ high, and features a unique twist hand break that provides speed control on hilly terrain. The stroller also has a very compact one-handed fold making storing and transporting this stroller a breeze. The wheels can even be removed easily to make it even more compact when collapsed. The stroller can hold up to 75 lbs as a single, and up to 100 lbs as a double! If you are in the market for a Travel System, this is easily one of my favorites. Not only is the price tag pretty great, this stroller also can grow with your family from a single to a double stroller with no tools or extra parts needed. This stroller system is ready to go out of the box, so no tool box needed at all! With up to 22 different configurations, this stroller is perfect for one or two riders. The seats can be easily adjusted to either parent-facing or forward-facing modes. Another great feature of this stroller is its extra-large storage basket that expands to over two feet in length. There will be no shortage of space to pack up all of the things you will need for your outing! If you are in the market for a more Luxury Travel System, look no further than the UPPAbaby Vista Travel System. This travel system includes one full-sized front or rear facing seat + bassinet + MESA car seat, and it is a perfect stroller that adapts to your growing family. This stroller will accommodate your child from birth through their toddler years, and can configure in multiple ways, transporting up to three children at ones — all while strolling like a single stroller. It has all the same wonderful features as the regular UPPA baby Vista Stroller, but it comes with the MESA Infant Car Seat, that can snap into place in seconds with no adapters needed. This is a very innovative product that I thought would be an interesting option to include on this top picks list. This product is a super safe infant car seat and stroller all in one! 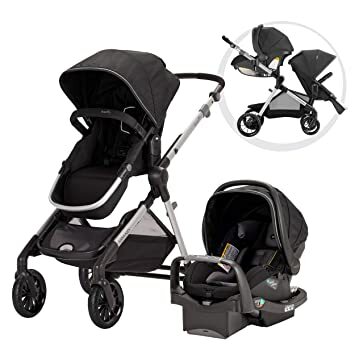 I wouldn’t recommend this as your primary stroller, but if you are someone who lives in the suburbs and is constantly on the go, traveling in airports, etc — this stroller/car seat combo would be an invaluable piece of baby gear for you! The car seat easily removes from the car seat base, and with a simple press of a button, the wheels pop out and it is now a stroller! If you are out and about and need to hop into a tax or Uber, you can very simply (and safely) install this car seat using something called a European belt path in under a minute! The infant car seat is super safe, and the handle bar also doubles as a rebound bar if you were ever in an accident. This stroller is suitable from 4lbs to 35 lbs, or a maximum of 32″ height. Frequent travelers will love it, but you may wish to re-sell it once your little one grows out of it, and you need a larger stroller.